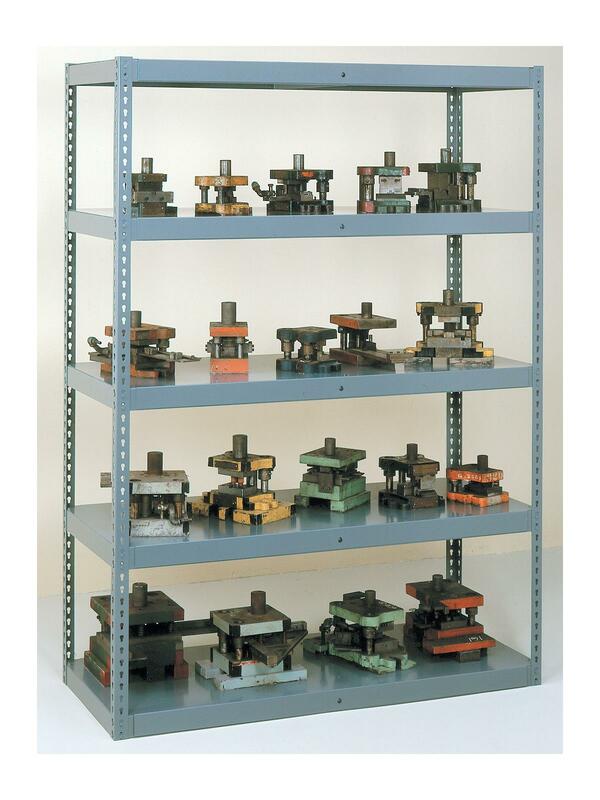 Tennsco High-Capacity Rivet Shelving | Latta Equipment Company, Inc. Perfect for storing dies, motors, jigs, fixtures and other heavy material. Each shelf will support up to 4000 lbs., evenly distributed. Semi-boltless design utilizes snap-in double rivets on the shelf supports matched with keyholes on the posts. Maximum capacity per unit is 13,000 lbs. Heavy Duty 14 ga. posts are 2-1/16" x 2-1/16". 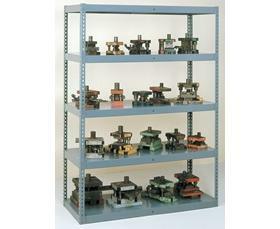 Each unit has five 16 ga. shelves that are adjustable in 1-1/2" increments. Shelves are supported on four sides with 14 ga., 2-3/4" high shelf supports. Additionally, shelves have from one to three center supports depending on the width. Center supports are bolted to the shelf supports for added rigidity. Durable powder coated Medium Gray finish. FOB Shipping Point. 48 x 18 x 72"48 18 72"